A 68-year-old patient presented to her local ophthalmologist with right eye visual disturbance. She was subsequently urgently referred with possible right eye retinitis. On examination, visual acuity was 6/24 in the right eye, correcting to 6/12 with pinhole. The acuity was 6/6 in the left eye. There was no evidence of inflammation in the anterior chamber or the vitreous. Examination of the right fundus showed discrete areas of retinal whitening consistent with cotton wool spots rather than retinitis. (Figure 1). Further history taking was helpful in this patient. She described several episodes of transient visual loss occurring that day in the right eye, each lasting a few seconds. In addition, she had a new onset headache for the past month in association with malaise, muscle tenderness and weight loss. She had also noticed an ache in her jaw when chewing her food. She had been to see her GP but no diagnosis had been reached. She also commented that she had noticed a “lumpy area” on her right temple for two weeks. These symptoms strongly pointed towards a diagnosis of vasculitis secondary to Giant Cell Arteritis (GCA). On examination, there was a thickened and non-pulsatile temporal artery on the right side. Inflammatory markers were checked urgently and were found to be raised: ESR – 74 mm/hr, CRP 72 mg/L. The patient was admitted to hospital and immediately given high dose intravenous methylprednisolone for three consecutive days. On the second day of her admission a temporal artery biopsy was performed. The histological examination of the biopsy showed granulomatous inflammation with giant cells, diagnostic of GCA. She was discharged on high-dose oral steroids which were subsequently tapered slowly. Figure 2. Right eye 2 weeks after the initiation of steroid treatment, the cotton wool spots have started to resolve. Two weeks after her initial presentation her vision was 6/6 in both eyes. Her symptoms of malaise, headache and jaw claudication had resolved entirely. There had been no further visual disturbance or transient visual loss. The ESR was 2mm/hr and the CRP 1.3 mg/L. The cotton wool spots had started to resolve (figure 2). At this stage her care had been transferred to a neuro-ophthalmologist. How often does Giant Cell Arteritis present like this? 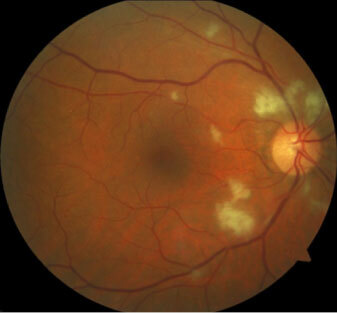 Ocular signs of giant cell arteritis include ischaemic optic neuropathy, often in association with a pale, swollen optic disc. Sometimes GCA can be associated with retinal arterial occlusion, cranial nerve palsies or ocular ischaemic syndrome. In this case, clinical features highly suggestive of GCA included jaw claudication, new onset headache and polymyalgia in association with a thickened non-pulsatile temporal artery. Transient visual obscurations, as in this case, are an ominous sign that the patient is at high risk of sudden and irreversible visual loss. The presence of cotton wool spots should arouse suspicion of GCA in older patients, even if the remainder of the clinical picture is not as clear-cut as in this case, although cotton wool spots are usually seen in association with other GCA symptoms or signs. Hayreh et al published a series of 170 patients with biopsy proven GCA. In this cohort, 85 patients had visual loss and 28 (one third) of these patients had cotton wool spots on fundoscopy. This implies that cotton wool spots are another potentially ominous sign in patients with underlying GCA. Cotton wool spots be a useful clue to suggest GCA in older patients and should prompt further directed history taking and investigations. The evidence suggests that patients with GCA and cotton wool spots are probably at high risk of visual loss.